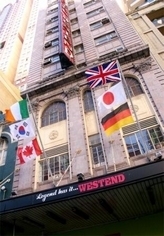 Welcome to Sydney's best located hostel - Nomads Westend is 13 floors of fun, comfortable accommodation, a rocking 7 day/nightly party planner and so much more! Backpackers welcome to the Legend that is Westend! We accommodate all, from our legendary 32 bed dorm (otherwise known as The Church), to our 4 to 6 shared mixed and female dorms, we promise to look after all of your sleeping needs. If you fancy a little more privacy then we are here to help. With our cosy double, triple, and family rooms you couldn't ask for more - But wait all dorms have their own private bathrooms, linen is provided and air conditioning in all! Legendary I hear you say! Nomads Westend will ensure you have an awesome time from beach days to Bondi, nights out partying with over 300 backpackers and discounts in selected bars, you really will never want to leave. Our promise to you is to make an awesome memory, one that you look back on, smile and know that Westend was and always will be the most legendary backpackers in the most amazing city in the world, our beautiful Sydney. This room has 2 bunk beds and an ensuite bathroom. This room has 3 bunk beds and an ensuite bathroom. 32 Share Dorm "The Church"
This room has 14 bunk beds and share facilities. Check In time is 1400 and a valid passport or drivers license is required for check in. Westend is only a 5 minute walk from the station. Take the Eddy Avenue & Pitt Street exit and follow Pitt Street up towards the city centre. Westend is located on the right hand side of the street (412 Pitt Street). If you stay with us for a minimum of 3 nights we offer a FREE one way airport pickup to Westend with Sydney City Shuttle Buses ONLY. (This offer does not apply for groups over 10). The return fare is $12 on the shuttle bus. Guests MUST call Westend upon arrival at Sydney International or Domestic Airport to arrange a FREE transfer (minimum 3 night stay). The last Sydney City Shuttle Bus departs the Domestic Terminal at 930pm and the International Terminal at 10pm, transfers after this time can occur by train/taxi at guests own expense. If a guest has purchased a Westend Work Package and their time of arrival is after 930pm a transfer from Westend to the airport will be offered in compensation.